SHANGHAI (AP) — Walt Disney Co. opened Shanghai Disneyland, its first theme park in mainland China, with a lavish celebration Thursday featuring Communist Party leaders, a children's choir, Sleeping Beauty and other Disney characters. A vice premier joined Disney CEO Bob Iger in cutting the grand opening's red ribbon, showing the ruling party's support for the $5.5 billion investment in promoting tourism at a time of slowing economic growth. They read letters of congratulations from the Chinese and American presidents, Xi Jinping and Barack Obama. "This is one of the proudest and most exciting moments in the history of the Walt Disney Co.," Iger said after the choir sang. Later, actors dressed as Sleeping Beauty, Donald Duck and other Disney characters danced on stage. The company hopes Shanghai Disneyland will burnish the brand behind "Frozen" in the world's most populous film market and help revive Disney's struggling international theme park business. Analysts expect Shanghai Disneyland to become the world's most-visited theme park, attracting at least 15 million and as many as 50 million guests a year. By contrast, Walt Disney World drew 19.3 million people in 2014. Speaking as a light rain fell, Vice Premier Wang Yang quipped, "I would like to call this a rain of U.S. dollars or of renminbi," the Chinese currency. Wang, a member of the ruling party's Politiburo, described the park as an example of Sino-U.S. "practical cooperation" and "people to people exchanges." The festive sentiment was tempered by news from Florida that an alligator killed a 2-year-old boy at Disney's flagship Walt Disney World. The boy drowned after the animal dragged him into a lagoon on Tuesday. Despite slower growth, China's economy still is one of the world's best-performing and tourism spending is rising. Shanghai represents a market of 300 million people living within three hours of the park by car or train in one of China's most affluent regions. China's bullet train network can draw in areas further afield. YouGov, a market research firm, said 44 percent of people it surveyed in China in May said they plan to visit Shanghai Disneyland within a year. It said 80 percent plan to take family members. "I think it's really lively here and every girl can realize her dream of becoming a princess," said Gong Haiyan, a visitor from western China's Sichuan province. Wang Lei, 34, said she liked the park, despite long waits for some things. "I'm sure I will go again, maybe again and again," said Wang, a buyer for a Shanghai food chain. "I'll bring my kids and relatives from my hometown." Chinese are not cutting back on tourism despite the weak economy, said Shaun Rein, managing director of China Market Research in Shanghai. "They are still spending on experiences and on their kids," Rein said. "It's going to be a huge success. 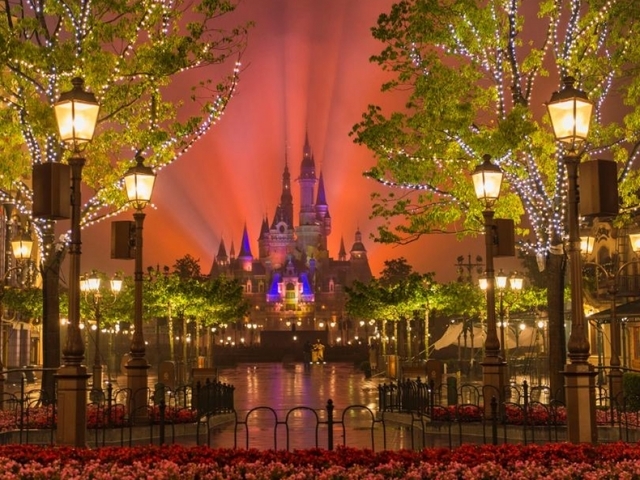 Everybody in China who has a kid or a grandkid is going to want to go to Shanghai Disney." Disney's opening follows a decade of negotiations, five years of construction and weeks of testing. Iger said more than 1 million visitors already have tried out its rides, shops, restaurants and two hotels. Global brands like Disney are rushing to create products for Chinese tastes. The company added China-themed elements and put the emphasis on popular characters at the Shanghai park, while downplaying its American identity. At the entrance, instead of "Main Street USA," it's "Mickey Avenue." Near its iconic Storybook Castle, Disney created a "Garden of the Twelve Friends" using characters such as Remy from "Ratatouille" and Tigger from "Winnie the Pooh" as animals of the Chinese Zodiac. Disney says the Wandering Moon Teahouse, modeled on a building in eastern China, is the only Chinese-style structure in any of its parks. The park should generate some $1.5 billion to $4.5 billion a year in revenue, according to Drexel Hamilton analyst Tony Wible. However, Disney's state-owned Chinese partner, the Shanghai Shendi (Group) Co. Ltd., which owns 57 percent of the 7.5-square-kilometer (2.9-square-mile) park, will get the lion's share. Disney's international parks in Paris, Hong Kong and Tokyo haven't made a profit in six of the past 10 years, Wible figures. So the main advantage of the huge park may be promotion of the brand and merchandise. Disney has many inexperienced but ambitious competitors in China. China is a challenging environment in other ways, with official controls on business activities and on taking profits out of the country. Live shows such as Disney's "Lion King" musical must be approved by Chinese censors. Disney's DisneyLife direct-to-consumer online movie and book offering was closed in April, five months after opening, amid a Chinese regulatory review. In the Shanghai park, Disney needs its Chinese partner's approval to change restaurant prices and other management details. "They are hamstrung in a lot of areas," said Rein. But still, he said, Shanghai Disneyland "is far above anything else in China." One big risk is that the park will prove so popular potential visitors may be put off by the crowds. Jin Yasi, a 33-year-old housewife from Wuhan, came with her husband and their two daughters, aged 6 and 3, dressed as Elsa from "Frozen" and as Snow White. Jin said she has visited Hong Kong Disneyland, the company's first park in Greater China, three times. "The castle is definitely great," Jin said. But after waiting an hour to get through a security check, she said, "I think they should offer better service."